As a unique gift for my mother I decided I wanted to make her a tote bag for her shopping. I'd made her one a few years back with a few fat quarters but this time round I wanted to make something more special. 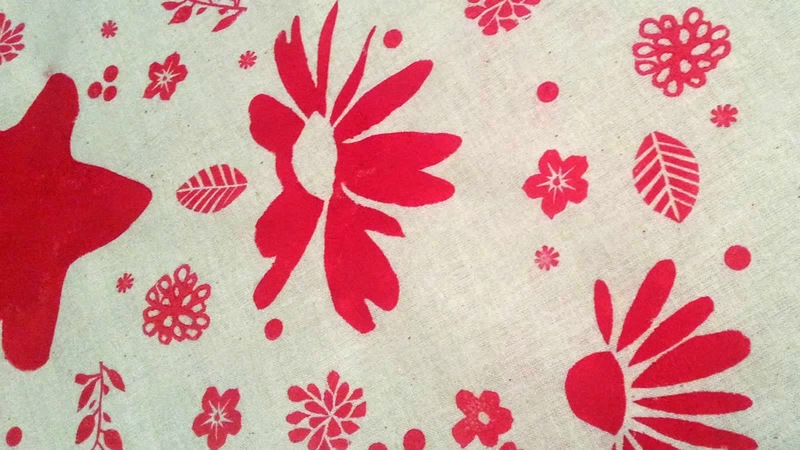 Inspired by this tutorial on craftbuds.com I decided to hand print a design on some natural cotton. The thing that stood out for me with this tote bag tutorial is that it has four sides and many versions of totes I've seen have just a front and back sewn at the seams. A four-sided tote gives a lot more volume which is ideal as a shopper. 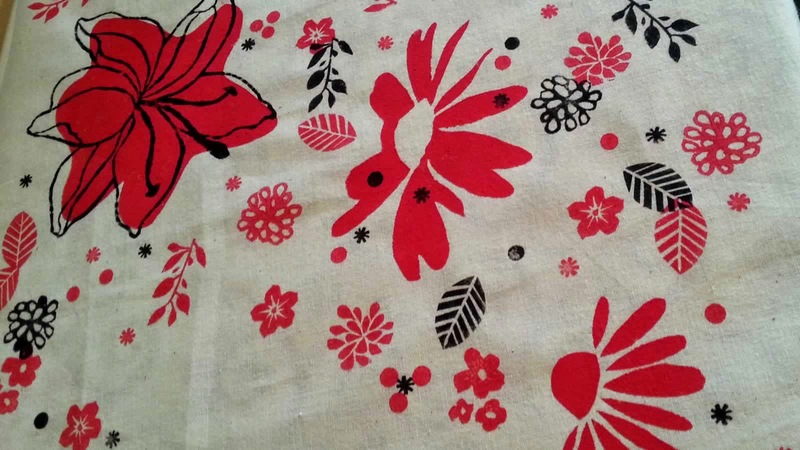 I bought some natural cotton with a good weight so that the sides would be a little stiffer. Normal weight cotton is fine but the bag is a lot softer and collapsible. I cut out the main tote shape and set about using my various hand-made stamps and fabric paint to decorate. I'd read that stamps can be carved from erasers / rubbers, so as they are readily available and cheap I bought a few of varying sizes. 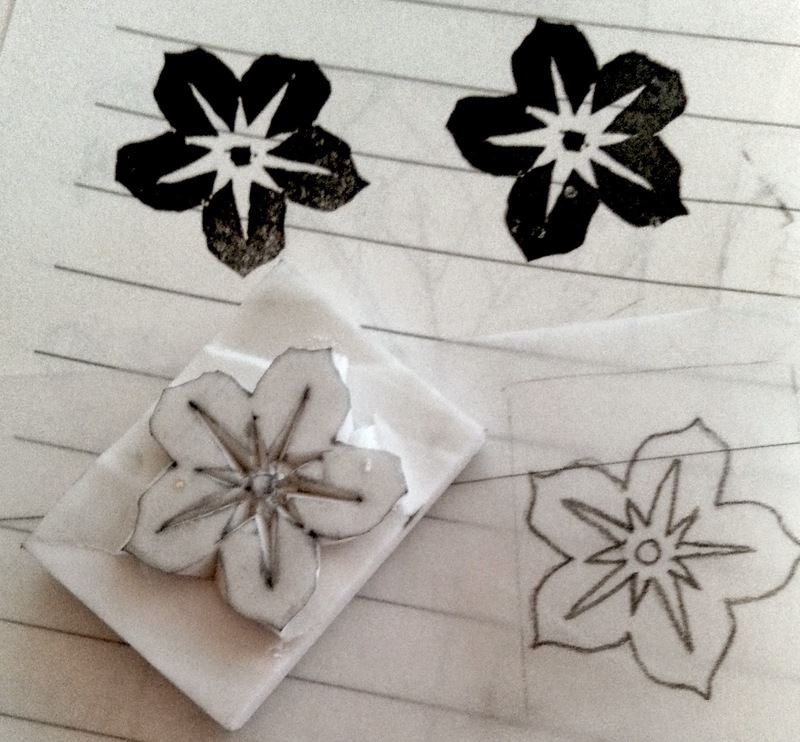 I sketched some flower shapes onto tracing paper and transferred them onto the eraser, then carved with a craft knife. I'd say that in hindsight that stamping with these erasers means your stamps have a very limited shelf life and if you have a design that you think you'll reuse often then investing in proper rubber stamping carving blocks would be a better option. I haven't done that but I'm sure to in the near future. Making your own rubber stamps is an addictive process. 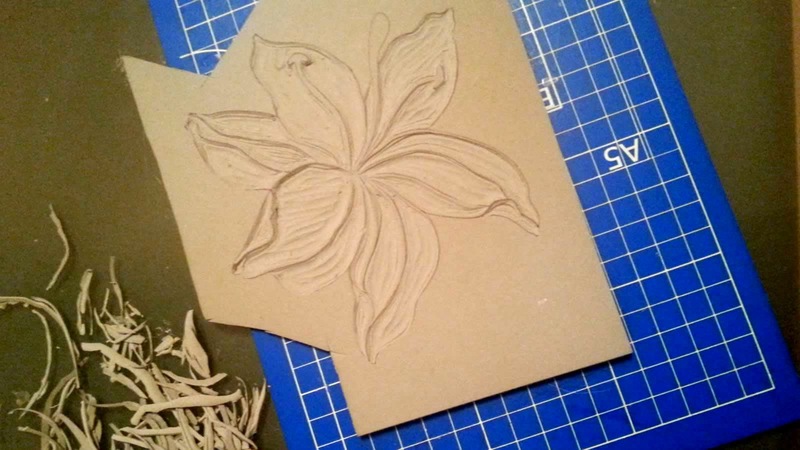 I had some left over lino from some projects I'd done a few years back so made a larger flower using a sketch on the lino cut out with some lino cutting tools. I'm hopeless with flower names, but this one was copied from my sitting room wallpaper. 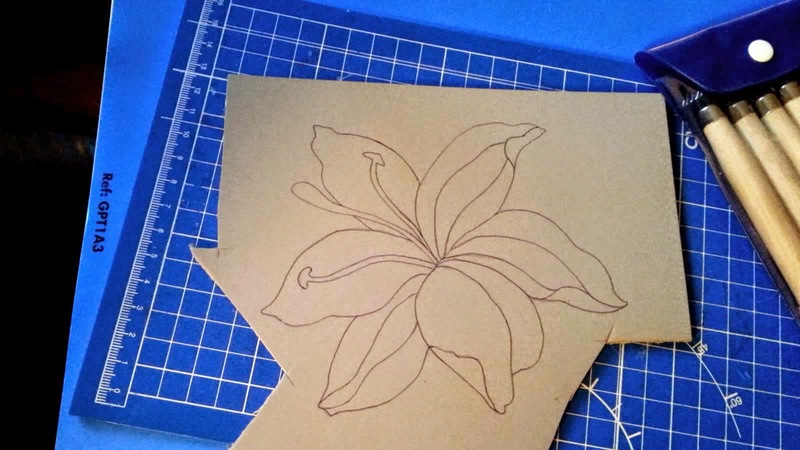 I also opted to cut out a rough stencil shape in the shape of the flower as a colour fill which I was happy to be offset for a more hand-made result. 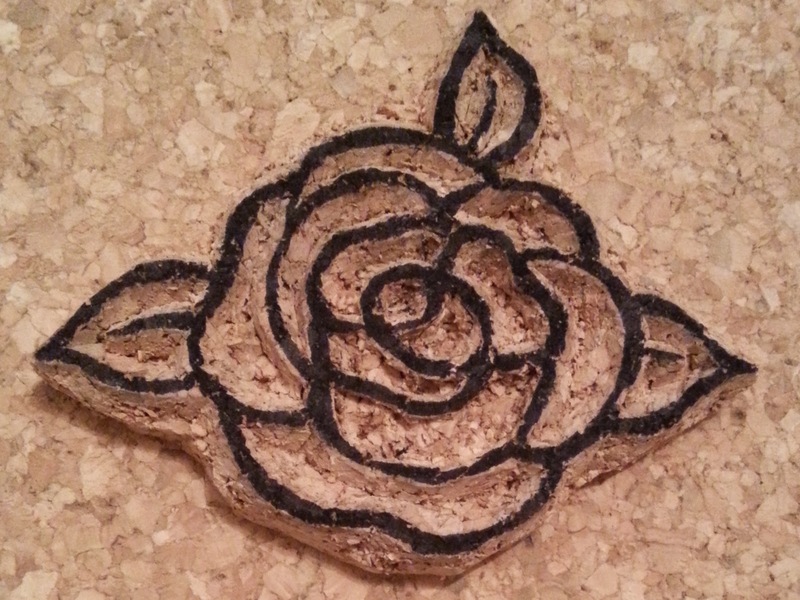 Cork is also a good medium for carving although its a bit tough to get started and gives a more rougher printed result. I bought some cork place mats and set about transferring a design and carving it out with a craft knife. Its best to carve at a 45 degree angle, which gives a cleaner line. With some practice you get a nice stamp and its quite durable too. I also stuck some wooden buttons from my crafting supplies to a few wine corks, which make great stamps. The stamps themselves are very pretty. So armed with a variety of printing styles I set about applying fabric paint to each stamp and building up a pattern on my fabric. Pencils with little rubbers on the end are also good for creating dots, and they can also be carved, which is how I got the little starburst shapes. It was great fun and totally unique but its difficult to get carried away and keep on stamping! Once the paint had dried and was set with an iron, I then sewed the tote bag. It had a cerise pink cotton lining and two sets of handles. Long pink handles for carrying over the shoulder and short black handles for holding by hand. The finished bag was lovely if I may say and it was very well received by my mother. Its functioning very well as a shopper I hear. My name is Hayley Easton and I am a Front-End Web Developer. I've customised by Blogger site to showcase some of my craft projects. The site will change as I update the design and add extra features. I hope you like my work, thanks for visiting. Visit my Instagram page for snaps of my latest projects. Copyright © choochoorocks 2015. All rights reserved. Blogger template built by Hayley Easton using Bootstrap and jQuery.